As naturalists at the Marine Discovery Center, it’s common to encounter wildlife on our eco-tours. Guests love it and we do, too! But sometimes we encounter wildlife in need during our tours as we paddle in kayaks or cruise past mangrove trees on the Discovery boat. We often see dolphins and birds entangled in monofilament fishing line. Sometimes we see stranded manatees stuck on sandbars. As the rookery islands were springing to life earlier this year with nests of various bird species, I encountered a baby pelican on the ground during one of my tours. That chick had fallen out of its nest and was dragging a bloody wing. It’s not uncommon for birds to fall from their nests or even be pushed from the nests by their siblings. When that happens, we monitor those grounded birds to make sure their parents are still feeding them. Most of the time, these chicks are just fine. Once they have matured and grow enough feathers to fly, they quickly learn to feed themselves and no longer depend on their parents for meals. However, adults were not tending the chick with the injured wing. 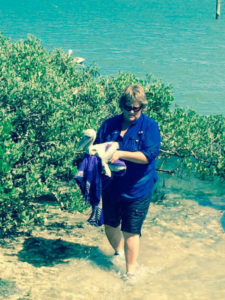 I observed the baby on three different occasions and on my last observation, I decided to hop off the Discovery boat, wrap the chick in a large towel and drive it up to the bird rehab hospital at the Marine Science Center. At their vet’s office, I was told the chick had suffered a broken wing. I left the baby at the hospital for treatment and hopefully, eventual release. More recently, I was on a kayak tour with two guests. As we paddled around the back of the rookery islands, I was telling them about the different bird species that nest there and how we were at the end of the nesting season. There were only a few stragglers still on nests, I told them. About that time, I looked up inside the westernmost island and saw a chick hanging upside down from a nest. There was a very large adult black-crown night heron standing on the nest and the chick was dangling precariously by one leg. Its tiny wings flapped helplessly as it remained suspended above the mucky floor of the mangrove island. I pulled my kayak over to the mangrove trees and got out of my boat. Walking below the nest underneath the trees, I could see that the tiny struggling chick had caught its foot in the nesting materials. At that point, I summoned the gentleman on my tour and asked if he would assist me with the rescue. Out came the gloves and carefully the plump little heron chick was lifted back into its nest. With the baby safely back in its nest, we quickly left the rookery island so the parent could return. The next day, I saw the adult heron sitting on the same nest, presumably with the rescued chick comfortably underneath its mom. I spied another black-crown night heron nest not too far away, indicating that either these birds had renested because their first attempt was unsuccessful earlier in the year or that they had produced a second brood within the same nesting season. To be clear, all of the naturalists at the Marine Discovery Center have helped rescue various species here in the Indian River Lagoon at some point in time. We clear fishing line from the rookery island mangrove trees on a regular basis. We respond to stranding calls. We watch for creatures in need. Sometimes, we ask our guests if they want to assist, which enables us to help the animals more quickly. 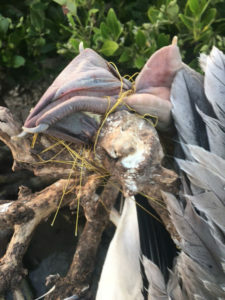 When that happens, it gives our guests a personal understanding of the challenges these creatures face every day living in a busy place surrounded by humans, boats, fishing gear and other species. In an ideal world, we would only observe the beauty of the birds, the athleticism of the dolphins, the lumbering leisure of the manatees and the surprising appearance of sea turtles. We would never touch them. But sometimes when we have to reach out, it’s to offer a helping hand to these creatures, safely returning them to their natural habitat in a shared space we all call home.